Writing a new pastoral letter will not end racism in the United States, but Bishop Shelton J. Fabre of Houma-Thibodaux, Louisiana, hopes it can be a step in that direction. “The pastoral letter was an effort of the bishops to add their voice to the dialogue that seeks healing and reconciliation among the races,” said Bishop Fabre, the chairman of the U.S. Bishops’ Ad Hoc Committee Against Racism. Bishop Fabre’s committee is tasked with guiding the Church in the United States to implement the insights and recommendations outlined in “Open Wide Our Hearts: The Enduring Call to Love — A Pastoral Letter Against Racism,” which the U.S. Conference of Catholic Bishops approved on Nov. 14 during their November general meeting in Baltimore. Bishop Fabre spoke with Our Sunday Visitor about the letter’s aims and his hope that Catholics take seriously its call for reflection and action. Our Sunday Visitor: Nearly 40 years after “Brothers and Sisters to Us,” why is this the right time for a new letter on racism? The effort really began four years ago when it was noted that racial tensions in the country were rising. There were police killings, acts of violence, tensions among the races and the rise in inflammatory rhetoric. So [we] began to put things into place to issue a letter that would come to the floor of the bishops in November 2018. Also, we were looking to appropriately mark the 50th anniversary of the death of Dr. Martin Luther King. 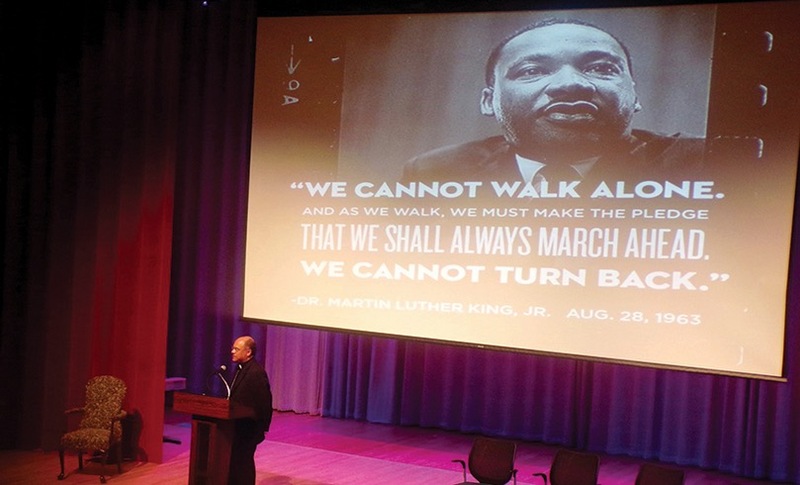 Bishop Shelton J. Fabre: OSV: Why have racial tensions been on the rise? Bishop Fabre: I think as human beings, we always struggle against evil and against sin in our lives. But I think in addition another reason is the rise of social media. The anonymity and the reach in social media, in my opinion, has emboldened people to say things and give them [the] impression that certain things are okay or acceptable behavior. Also, our political rhetoric is a great challenge right now. The current state of our inability to talk to one another, even politically to try and reach across the aisle, certainly doesn’t help. OSV: How has the Church been complicit in the sin of racism? Bishop Fabre: I think the Church in the United States has not always been very accepting or welcoming to other cultures and other expressions of faith. … I think sometimes the Church has not spoken out strongly enough against racism. I also don’t think we preach enough about it. OSV: How can the Church help with racial reconciliation? OSV: Does the Church have the credibility to tackle racism? Bishop Fabre: … [Y]es, because the Church is diverse, and the reality is that the Church in the United States is becoming more diverse. Rooted in Jesus Christ, the Church has the credibility to speak and to call people to reflection and action in this regard. Hosting listening sessions, listening to people in the Church, listening to how they have been hurt by racism in the Church, I think that builds our credibility as well. OSV: What stood out to you in the listening sessions? Bishop Fabre: The things that stood out for me were the people’s great pain and hurt, and how they have been hurt by racism in the Church. The other thing is that while many of them at the listening sessions will share their hurt, a surprising number will say, “I’ve been hurt by the Church, but I’m not going anywhere. This is my Church, this is my faith, I’m going to stay and I’m going to help the Church to overcome this challenge.” One thing is painful to hear. The other is very hopeful to hear. OSV: How can we make it so that being anti-racism is as synonymous with being Catholic as it is to be anti-abortion? Bishop Fabre: At the very heart of the Church’s pro-life stance is the human dignity of every single person. That is very clear in the Church’s teaching with regard to the evil that is abortion. In the document, we say racism is a pro-life issue because it denies the human dignity of the person. While I stand in support of the Church with regard to the evil that is abortion and the number of lives lost with that, I think that if we could somehow also get that understanding of the dignity and sanctity of human life to also be reflected in the other pro-life issues, such as racism, I think that would be of great benefit. I think that’s the challenge to us. OSV: Some have criticized the letter for not being forceful enough. Is that a fair criticism? Bishop Fabre: The letter does not end the teaching of previous documents. It adds to what the bishops have said. In that regard, I would say that the thoughts and teachings of previous documents remain in effect, and here are some more. Also, each person in each diocese is called to read the document and to pray. It is hoped that the issues that arise in each and every local Church will be examined from the perspective of this letter. OSV: Is there anything else you hope people take away? Bishop Fabre: I really encourage people to read the document, to see what the bishops have said and to ask themselves, “Where do I see myself in this document?” The document is written to those who have been harmed by the sin of racism. It’s written to those who are working to heal racial tension, and it’s also written to those who might perpetuate racist acts. I would hope people would give time in their life and in their prayer to read the document and to act appropriately on what rises up in their prayer and in their heart.